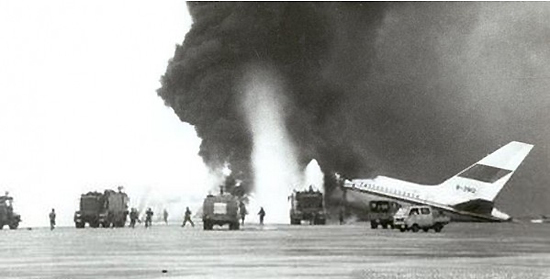 The Guangzhou Baiyun airport collisions on Oct. 2, 1990 were caused by the hijacking of Xiamen Airlines Flight 8301. A man named Jiang Xiaofeng, pretending to offer flowers to pilots as a Moon Festival gift. Once he entered the cockpit, he opened his jacket to reveal 15 pounds of explosives strapped to his chest. He asked the pilots to fly to Taiwan to seek political asylum. The pilots did not comply, telling Jiang that there was not enough fuel in the plane to fly to Taiwan and tried to land in Guangzhou. Unfortunately, when the hijacked aircraft attempted to land in Guangzhou Baiyun International Airport, it collided with two others on the runway, causing 128 deaths. Can you imagine being on a plane that has been hijacked? Even if you are lucky enough to survive, it is always a terrifying experience.